I’ve known Deepa Mistry for a while now. We bumped paths many moons ago - we worked next door to each other in the same building at one point, we have mutual friends in common, and we followed each other on various social media. As well as a “foodie” she is also an amazing jeweller. Her handmade pieces are truly stunning, they are simple, minimal and perfect for everyday wear (I know as I am also a customer!hah!). It’s funny how clients become clients. If you follow me on instagram you may have noticed I took it upon myself to learn how to use a sewing machine earlier this year. I started off by taking a short 4 week course and before I knew it, I was hooked! I can’t say I was surprised, it was a pleasure to spend one evening in the week with a group of friendly ladies, away from my iMac and doing something different. It was within this easy going atmosphere and great learning environment that I met Julie, the lovely lady behind the already established business and brand, Escape & Create. John contacted me a few weeks after our consult call and told me he and his client, Mark, were very impressed and that they wished to move forward with starting the project. Naturally, I jumped at the opportunity as I have never created a brand or website for a scientist who works with pharmaceutical and biotech companies. This was going to be interesting, and exciting at the same time! I couldn't wait to start! There are so many aspects of designing a new brand and website that I genuinely don't think I could pinpoint my favourite part. From the excitement of seeing the pinned items on the Pinterest homework that my client has completed to reading and understanding the business style, personality and values they want their new brand to encompass, all the way through to the challenge of ensuring their new brand is strong and distinct. It’s a fun creative challenge that I thoroughly enjoy. Dr Jesal Pankhania, an award-winning dentist, philosopher and mentor approached me last year to help clarify how he should organise and collect his interests. He wanted to bring his already thriving philosophy blog - “Ink stains for your brain” - together with his new venture of providing Mentoring and Dentistry advice and guidance, all under one roof, one name, one brand.His main concern was how to create this “new world”. As we discussed the project, it became clear that a personal brand would be the best fit for Jesal. His emphasis on being able to provide advice, guidance and information meant that this project would be unlike any other I have taken on. There was a lot to keep in mind throughout the whole project. It wasn’t going to be as straight forward as other projects, and, if I am honest, that really excited me! Like every branding and website design project I always ask my client to complete a few required tasks beforehand so I get a better understanding of their needs. It’s a really important stage. As part of the questions, I asked Jesal to describe his new brand with a few adjectives. I also asked Jesal to create a Pinterest board, and pin items he felt visually represented the look and feel he wanted in his new brand. I do this with all my branding and website design projects as it gives me a good idea of the styles and colours they are drawn too. With all the homework complete, I can start to collect my ideas and create a moodboard. Also known as an inspiration board, this gives me and Jesal an idea of the visual representation of the brand I will be designing. A moodboard is a collection of images and colours that I can use as a reference point at every stage of the project, in particular, the design stages. The moodboard oozes clear, classy but funky and modern, doesn't it? This is definitely one of my favourite moodboards to date! It was awesome to read Jesal was really happy with the moodboard - it got signed off right away and that meant I could now start on the designing the most important aspect of the visual brand - the logo. I had quite a few different ideas floating around in my head, and I wanted to explore using negative space. Jesal was a fan of this as I could see he had pinned quite a few cleverly designed logos on his Pinterest board. I always create logo concepts in black and white as every logo should work well in one flat colour - this helps to ensure the type, the graphic element and the composition work well together before adding any colour. Experimenting with a few san serif fonts, which are naturally modern looking as they are clean and clear was fun, adjusting the tracking of the characters really helped as well. Jesal was torn between concept 3, where he liked the font and placement, but also really liked the idea of playing with the J and P as the other two concepts showed. I was slightly biased but when Jesal told me he loved the same one I did (concept 2) I was really excited. I designed a secondary logo for him to give him a little more flexibility in his new brand, too. Putting the brand board together really bought his brand together. Being able to see how to keep the brand consistent and seeing the other visual elements, such as the colour palette, logo variation, submark/watermark, patterns really helped. Brand boards - 7 Key Elements To Include! ..so that anyway visiting his new website would be welcomed by a correctly branded front page and social media links. 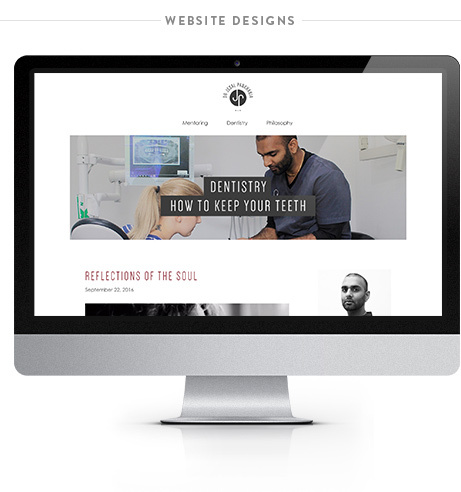 The last step in the design process was to design Jesals Squarespace website. Jesal had a lot of text he needed and wanted to share on his website, he also had numerous testimonials from people for the different offerings he has. It was important to be able to showcase that Jesal has 3 very distinct areas that are interrelated but are standalone in their own right. I’m thrilled with how this new brand and website design turned out for Jesal. I would love to hear your thoughts on it. Check out the live site - Dr Jesal Pankhania. What do you think of the new brand and website for Dr Jesal Pankhania? As much as I love being able to create a new brand and website design from scratch, I really enjoy the challenge of redesigning or revamping an existing brand and website. After working on the WellbeingZone brand and website I was asked to redesign the logo and website for Revitalised. Obviously, I wasn't going to decline! 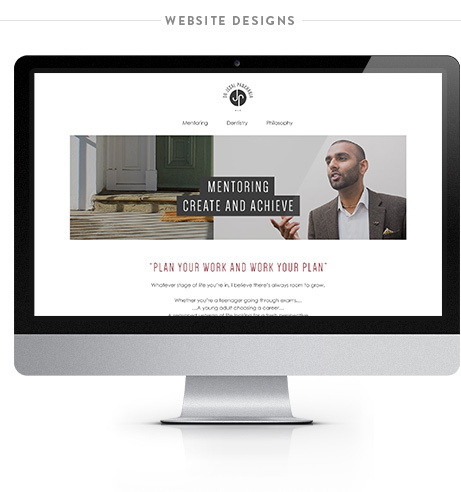 - It was my pleasure to give the Revitalised brand and website design (coming soon) a new look and feel. Revamping a design comes with all kinds of challenges - How far is too far to make the design look different without losing the core values? - That is if they have changed as well! Jo wanted to give Revitalised a breath of fresh air, it really needed, to be honest, and I was super glad about how it turned out. At the start of any design project, whether that be a new brand and website or a revamp, I always ask my clients a set of questions about their business vision, goals, and future direction of their brand, website and business. This helps me better understand their requirements so it's imperative it is done. As part of the homework, I also asked Jo to pin images she feels represents the vision (present and future) of the Revitalised brand on a Pinterest board. Sometimes I can't help but take a sneak peak at what my clients are pinning, and this was no exception! Before I was given the official go ahead I took a little sneak peak and was really excited to start. Once all the Pinterest homework is complete, I send my clients a list of questions, which are presented in a fillable PDF document. I also request this is completed before I start designing anything. Another aspect that came through from the homework was the request to keep the lower case lettering as part of the textual logo, and to refrain from totally stepping away from the use of "green" - This was important as it was a heavily recognisable aspect of their current branding and they did not want to loose this through the rebrand. Some would say hearing this is too restrictive of a rebrand, however, I took this onboard and continued to gather my thoughts and design ideas. I also thought it was great feedback, and at the perfect time as this influenced every design element going forward. Given how well Jo had completed the homework, and how well thought through the requirements were, I had an awesome sense of direction for the Revitalised rebrand, and so, the next stage was to create the moodboard. A moodboard is a collection of images and colours that provide a sense of direction for a brand, or in this case, a rebrand. I like to create a moodboard as it provides my clients with an idea of what is coming up based on what they have provided. It also helps me as I can refer back to this when I start designing. I have to admit, I love everything about this moodboard, the colours are fresh and uplifting with a sense of boldness, the image of the clean shaven, smartly dressed gentleman brings out the classy yet modern feel as well. I think this is definitely one of my favourite moodboards to date! Once the moodboad was signed off, it was time to design the logo! I love this part as it's one of the most important elements of any brand. My process for logo design is to create 2 or 3 different concepts, each incorporating the values of the brand, whilst also making sure it is eligible and simple in terms of look and feel. However, this time, I found my process didn't quite "work". Let me explain why, and before you think the worst, it all worked out for the best! However, like I mentioned, this process didn't quite work this time. I found I was only able to sketch and digitise one suitable logo. This was not due to time restrictions, but rather because I felt the other sketches/options didn't meet the requirements. This meant that I only presented one logo redesign. - I wasn't entirely sure how this would go down but I took my chances and presented. I felt by producing 2 other concepts, I would be providing a choice that did not meet the future vision, but in fact, I would be creating and showcasing concepts I felt did not meet the requirements. Jo was a little reluctant at first but trusted me with my direction. This was key as she has invested in my design know-how, services, and believes I will deliver the best option. Both of us were so happy with the final design of the revamped Revitalised logo. I know that I am slightly biased, but I love how the revamped green and modern font really has elevated the logo. The next step was to create the rest of the brand. A brand is not just a logo. A brand includes other visual elements as well, such as your colour palette, logo variation, submark/watermark, patterns and icons too. To finish the rebrand for Revitalised I created a brand board. This will help Revitalised stay consistent as the business develops and gives a simple overview of the brand elements in one quick reference document, a brand board is so handy for all small businesses and startups too. I'm super chuffed with how the rebrand looks and feels, I know there are plans to redesign the website to so watch this space! What do you think of the Revitalised rebrand?